the last few weeks the weather was November-like: much fog and nearly no sun. But on Tuesday we´ve had very good conditions. The sky was clear and no wind. The planetary disc looks total sharp by 230x in the eye-piece. A friend tested his new camera and after this I took my sketch-book and my pencils. We used visual a bino with two 17,3mm Delos. The equipment offered us a real great view with many details on the clowd-surface of Jupiter. I hope that you like the result. 10″ ACF on Vixen SXD, 17,3mm Delos binocular, 150x. 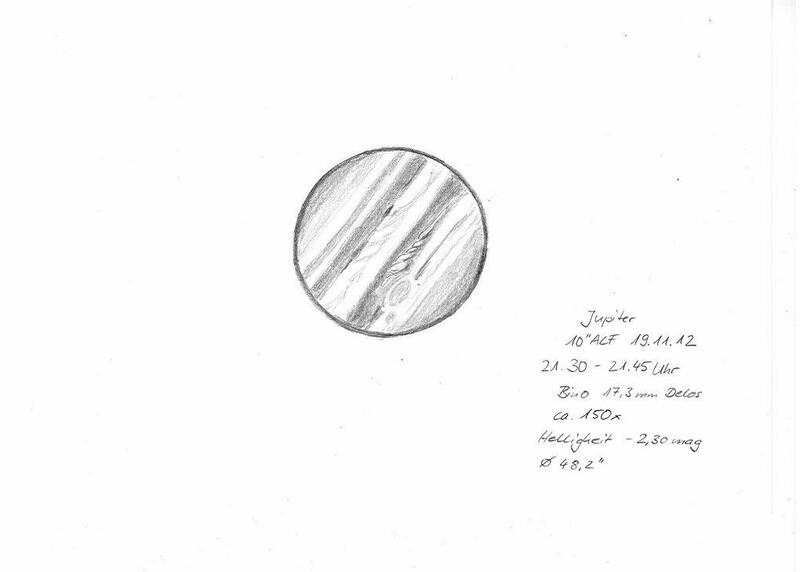 Very impressive capture of the detail on Jupiter. yex it was a great night. So I love it to fix the difining moments on paper. It it actually so easy, but most of observers don´t try it. After short time you train your eyes and it gives you advantages in viewing objects! yex it was a great night. So I love it to fix the difining moments on paper. It it actually so easy, but most of observers don´t try it.After short time you train your eyes and it gives you advantages in viewing objects!